Oh weddings... not sure if it is the love in the air, or the open bar, but weddings are my new favorite thing. It is so amazing to see my friends grow up and meet the person of their dreams, and then get to celebrate in their major milestone. 2 more weddings this season... bring it on! I'll better start practicing my Wobble! 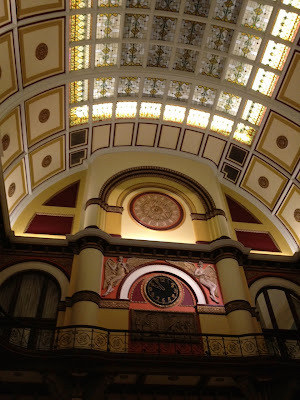 Ty's friend from college married the sweetest girl at a beautiful chapel on Vanderbilt followed by a reception at the historic Union Station here in Nashville. Neither the couple not the night could be more perfect. Cheers to their beautiful union and a happy life together. Getting dressed up to cut a rug at the reception! How's your wedding season shaping up? Are ALL of your friends getting married this year like mine?! Love your shoes! I have three weddings to go to this year- should be fun! Should be fun indeed! Near or far? :) You look super cute, LOVE this dress! And actually... last year all of my friends were getting married. This year I have one friend getting married this summer, but in Mexico! I will be attending her reception back in the States though. Otherwise, not another wedding until November! I think it is so fun though to see different wedding looks! 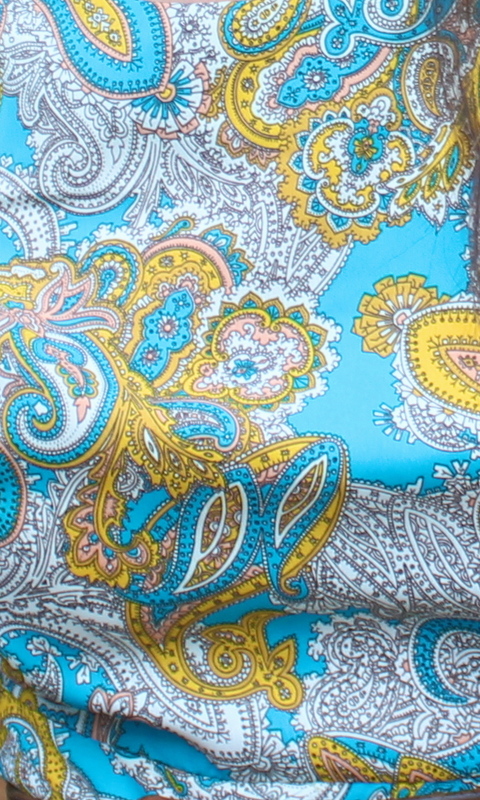 The paisley dress is just perfect! I have a couple weddings to go to... Decorating and organizing 2/3 so it's a lot more work then fun lol You look great! oh my gosh you look ADORABLE. i went to a wedding this weekend, too and i'm gearing up for a busy wedding season!! You rock the red lips! Looking lovely! We've got 5 weddings this season... 4 in July and one in Sept.
i love the HM dress, I saw it the other day, you looked fab!!!! i love wedding season, unfortunately I dont think we have any to go this year! I love the dress you wore to the wedding, so cute! Love the belt with it. You look beautiful! That dress is lovely, and the red lips are so great. Most of my friends are already married so I actually only have one to attend this summer. 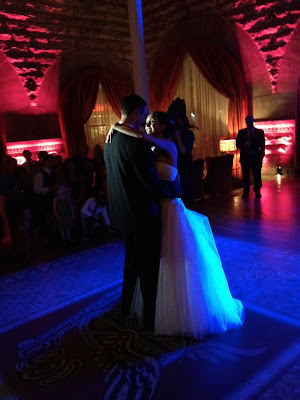 Did your friends get married at the Scarritt Bennett center? I actually called off a wedding back in 2006 (it was for the benefit of us both! ), and our ceremony was going to be there. Such a beautiful chapel. love that dress, I almost got it at H/M...so cute!! Love that you used a belt around the middle too!!! Oh I love that dress! I have a wedding coming up soon as well! Super cute look! Love how you added the belt! H&M always has the best dresses. Hope you don't outshine the bride! Thank you Grace. It was actually pretty funny that I wore this dress, because when I walked into the church, it seemed like every woman was wearing floor length black dresses... epp! But in the end I felt comfortable all night, so it worked out perfect! Thank you! I like weddings when they are in Nashville... attending one in Portland will be fun too... but my wallet does not agree! 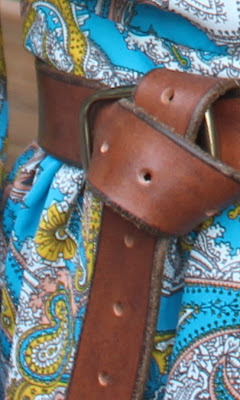 Thank you - my favorite way to personalize a dress is with a belt! beautiful outfit! you look lovely! 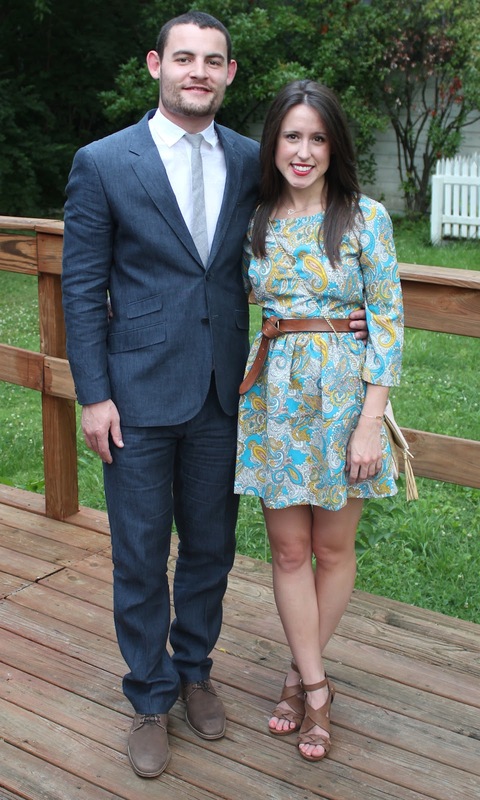 I don't think enough women wear printed dresses to weddings. I love the summery colors in this dress. I LOVE this dress. This outfit is so well put together -- love how you tied the belt. I always like seeing another southern girl style blogging (does anyone else really understand the humidity we deal with?) and I'm totally following you now! Went to Nashville for the first time last month and loved it. Will be making a weekend trip there soon. This H&M dress looks great on you! And I love love your wedges! Small world! I love Nashville and am headed over to check out y'alls site now! Wowzers! You are a wedding champ lady! Thank you! I hadn't had a single friend get married before this year, and now they are getting hitched every weekend! Start saving up your pennies now so you can travel to see all of your friends when they do jump on the bandwagon! Thank you dear! I guess I am on the young side of my friend spectrum since I entered grad school straight out of undergrad... I still have many wedding seasons ahead of me! I wasn't ever a girl to be planning my wedding, but after being involved in a couple this year, I am already forming an opinion of what I want and do NOT want in my own! so silly! Thank you! Wedges are my go to shoe - so comfortable, and my bf is always so impressed how much I can do in my wedges! Gorgeous dress! Love the print. Love this dress! Looks adorable how you paired it with the belt and sandals. Too cute! loving your sandals with the matching belt and the dress is so cute and in with it's scarf print motif! hope you had a fun time girl! You look gorgeous! 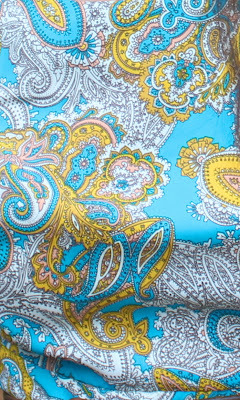 Love the colors and the paisley print. What a great look for a summer wedding! I just attended a wedding last weekend-tis the season! I saw this post earlier this week and I just love that paisley dress. The colors are just so bright and fun. Perfect wedding attire. you are adorable! loving that dress!! Love the dress, such a pretty print, and I adore how you matched it with bright red lips. such a pretty dress! and yes, all my friends are getting married but I'm in the weddings so I'm required to wear a bridesmaid dress:( Can't wait till I attend one where I can wear what I want! LOL! YES.. the rest of ALL of my friends are getting married this year! Now they're all looking at me?! haha anyway.. Thank you dear! I love finding new Bloggy friends! Oh yea, a little wine and cutting a rug are required! Thank you! We definitely had a blast well into the night! Only 3 more weddings this summer! Thank you Louisa... I still have to be extra brave to rock the red lips, but it is certainly fun! Ah, yes the bridesmaids dresses! I hope you got one you can wear again. I am my best friend's MOH in October, and I got to pick out my own dress! SCORE!